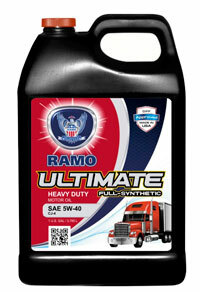 RAMO Ultimate Full-Synthetic 5W40 Motor Oil is new high performance diesel engine oil developed to offer the ultimate in diesel engine oil protection for your new and expensive equipment by offering a better and stronger armor against wear, improved performance and greater fuel economy. This new high performance oil is specifically engineered to meet the manufacturers’ prerequisite for performance, TBN, and balanced low ash (1% maximum) requirements. It will deliver superior long lasting protection for both turbocharged and naturally aspirated diesel and gasoline engines whether in highway or off-highway equipment. It is formulated for extended service/extended drain when operated under typical operating conditions and are engineered to help promote fuel economy. the new API CJ-4/SN Service Classification and meet prior API specifications for CI-4 Plus, CI-4, CH-4, CG-4, CF-4, CF-2, CF and API SL, SJ, and SH. This oil is registered Mack EO-O Premium Plus '07, and meet prior specifications for EO-N Premium Plus, EO-M Plus, and EO-M. This oil is also registered to Detroit Diesel 93K218, 93K215, and 93K214; Cummins CES 20081, 20078, 20077, 20076. This oil meets Allison C4 and C3 fluids and Caterpillar ECF-3, ECF-2, ECF-1, TO-2. This oil is also registered for the following European and Asian approval standards: Volvo VDS-4, VDS-3, VDS-2 and meets specifications for Global DHD-1; JASO DH-2 and DH-1. This oil is engineered to be robust enough to meet MB 228.5, 228.3, 228.1, 227.1; Man 3275; MTU Type I & II; ACEA E7-04, E4, E2, A3/B4, A3B3; and Renault RLD-3. This highly advanced diesel engine oil is recommended for use in MIL L 2104-G, MIL L 46152-E, and CID A-A- 52306 applications.